What Does it Mean When My Groomer Says My Dog is Matted? It means that your dogs hair has become tangled. 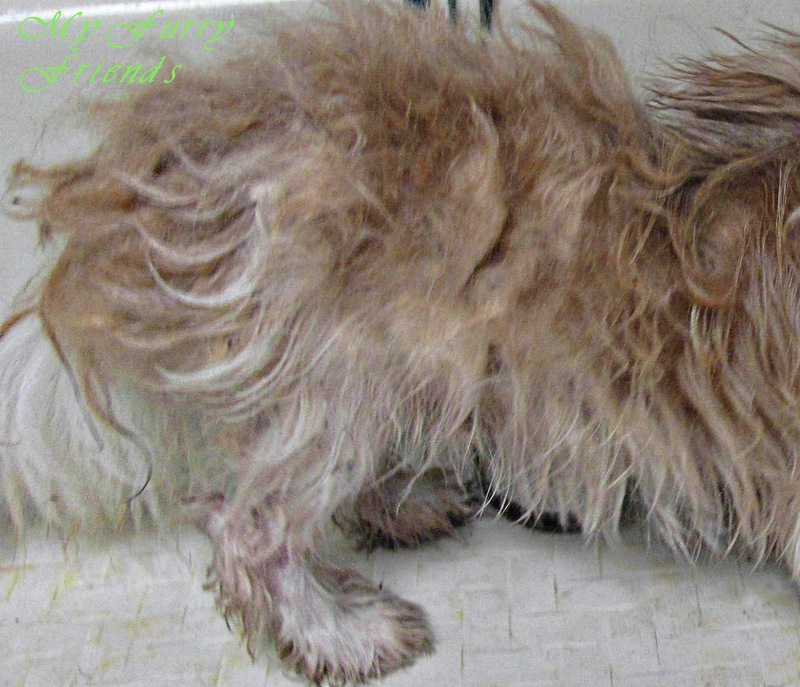 Matted and tangled hair on a dog can be caused by a number of things. Life is very busy these days, and many owners don't have extra time to stop and thoroughly brush out their dogs coat. Many pet owners are also under the false impression that they don't need to brush their pets hair. Unfortunately, many breeders and pet stores don't bother to educate the people buying their puppies about how to groom them between professional grooming's. Many medium and long hair breeds require daily brushing to keep the coat mat and tangle free. If your dog is left un-brushed between professional grooming's, their coat is more likely to become matted and tangled. Just imagine going even a week without bothering to brush your hair. Even coats on non-shedding breeds will mat and tangle if not brushed regularly. Some non-shedding breeds still shed dead hair. Unfortunately, that dead hair stays in the coat and wraps itself around the good hair causing mats and tangles. Other non-shedding breeds, such as curly coated breeds, will also mat and tangle. The curls in the hair can tightly wrap around each other causing mats and tangles if not brushed regularly. Why can't my groomer just brush the mats and tangles out? That is their job! A groomers job is to gently brush, comb, bathe, and trim or clip your pet. It is NOT the groomers job to de-mat a pets coat do to the neglect cause by the owner not regularly brushing their pet between grooming's. Brushing and combing mats and tangles out of a pets coat is a painful process in most cases. People become groomers to help dogs feel good, not to hurt them. It is an owners responsibility to take care of their dogs coat between professional grooming's. There are several different types of matting. Sometimes, light matting can be brushed out of a dogs coat, but it depends greatly on the dog itself. ~ how large and tight the mats and tangles are. Won't the mats and tangles just fall out when the groomer bathes my dog? Mats and tangles are not like dirt and can not be 'wash out' of a dogs coat. When matted and tangled hair becomes wet and is left to dry, the mats and tangles become even tighter, making them even harder to remove. On rare occasions a groomer can bathe a dog, with very light matting, and use special shampoos and conditioners to help the groomer loosen up the mats and tangles enough to be easily, and safely brushed out. I DO brush my dog everyday, but the groomer still said that he is matted. The most common mistake that pet owners make when brushing out their pets, is that they only brush the top of the coat. This means that when the owner is brushing their pets coat, the brush is not getting to the hair closest to the dogs skin, and is only going through the top part of the hair. The owner of this dog has been brushing their dog everyday. The top of the coat looks very nice. The owner had also been giving her dog bathes. 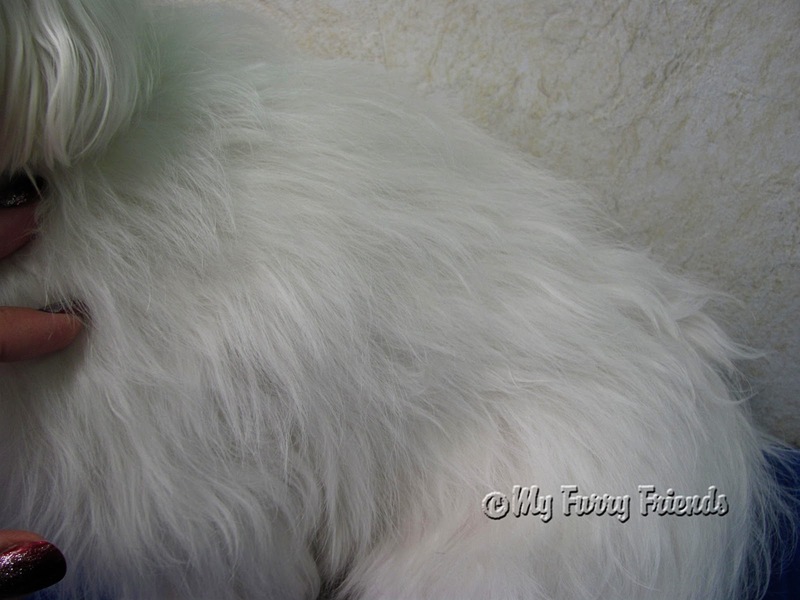 So why did the groomer tell this owner that the coat is matted and must be shaved off? 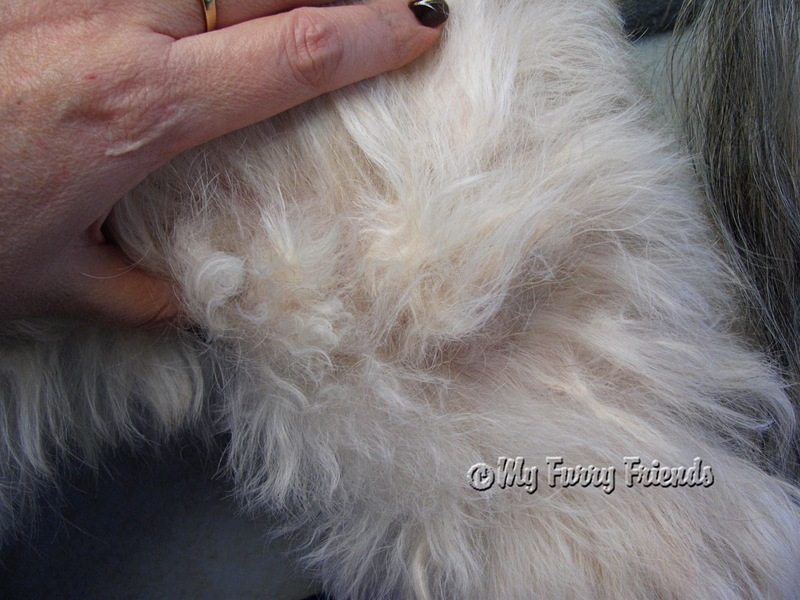 Because the owner had only been brushing the top part of the coat, the hair closest to the skin was matted solid. The matting had become one big solid mat covering the entire dog. 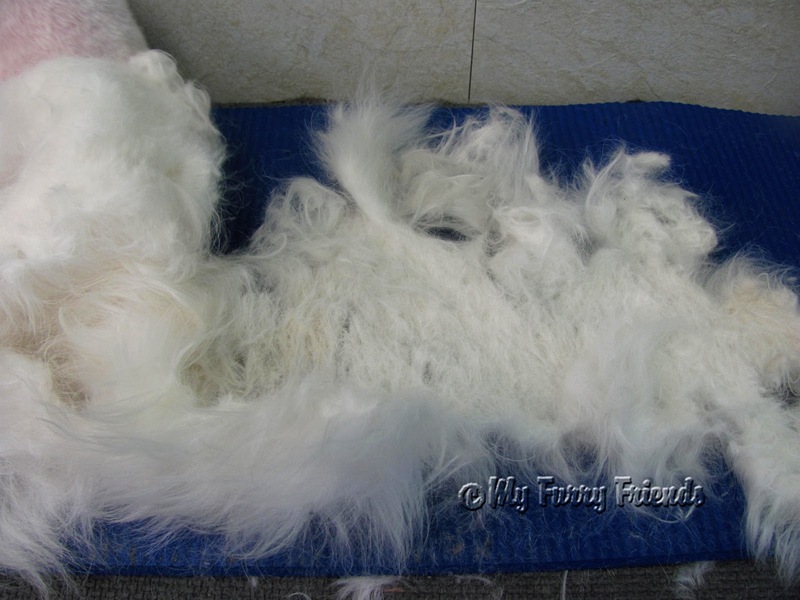 Because the owner had been bathing this dog with the mats in its coat, the mats had become so tight that there was no choice but to shave the coat off and start over. Why can't the groomer just cut out the mats and leave the rest of the coat? In some cases the groomer can cut mats and tangles out leaving most of the coat intact. There are several different types of mats. 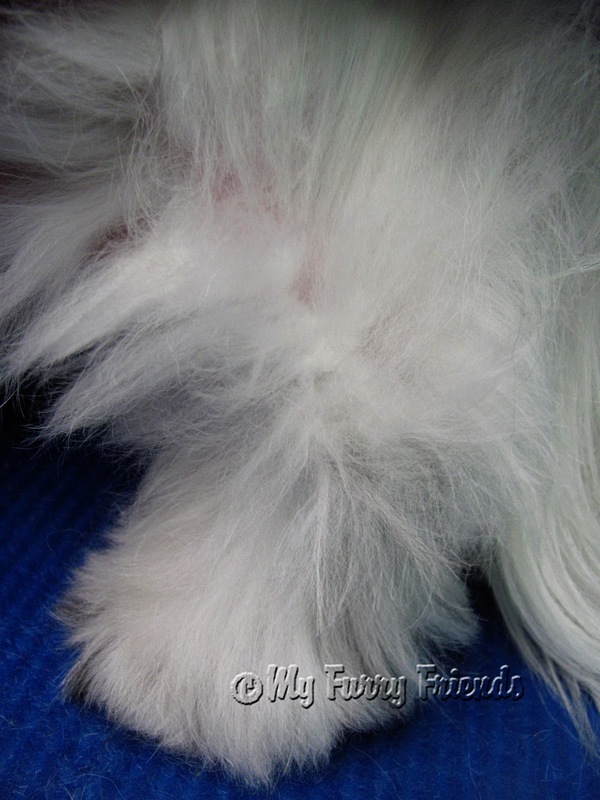 The leg pictured is a Shih-tzu's leg. This dog has a few small, looses mats that are not tight to the skin. The groomer was able to thin the mats out with thinning shears. Then the groomer gently combs out the small pieces of mats and tangles. This is all done as long as the dog tolerates the brushing and combing. Removing these mats and tangles also requires extra time and work for the groomer, and will cost extra over the basic price of the groom. The large mats on this dogs legs are covering 3/4 of his leg. Removing large, loose mats with thinning shears or clippers, to try to save the rest of the coat, would cause the dogs coat to look like Swiss cheese. It is better to remove the entire coat, to make the coat look even all over and start again. The mats on this Shih-tzu are large, hard, and packed tight to the dogs skin. 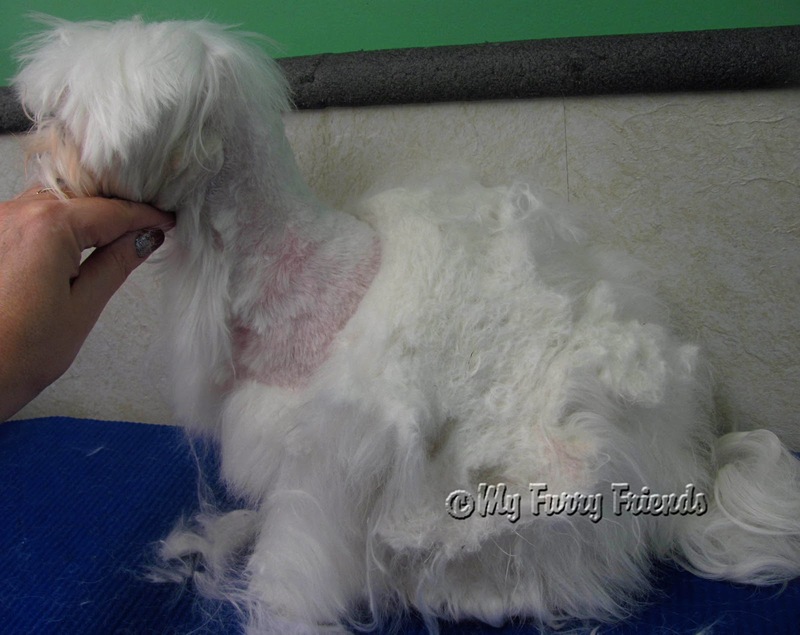 The groomer has absolutely no choice but to shave this Shih-tzu's coat off close to the skin. This is mats and tangles that have connected together all throughout the coat to make one continuous mat all over the dog. Once the matted hair had been removed, it looks like a web when you try to pull it apart. These mats a created when double coated breeds start blowing their coat and the dead coat is left to tangle up in the good coat. Most of the time, undercoat mats can be brushed out, but require a lot of time and work. If my dog is matted, why does my groomer have to shave them so short? It is not up to your groomer how short your dog has to be shaved. The matting determines how short your dogs coat has to go. Your groomer has to use a blade that will safely clip between the mat and your dogs skin. If the matting is not too close to the skin, the groomer may be able to use a longer blade safely. If the matting is tight and close to the skin, the groomer will have to use a very short blade. Most groomers do not like to brush mats out of a dogs coat. The people who choose to become groomers want to help your pet feel good. We want to give your pet a nice hair cut and help keep them healthy and clean. Groomers do not want to be made the bad guy by having to be the mean person who brushes out mats and tangles that the owner allowed to get into the coat. A groomer is not lying when they tell you that brushing your dogs mats and tangles out will hurt them. There are some dogs that don't mind having small mats and tangles brushed out. There are other dogs that are very sensitive to any tugging and pulling that brushing out mats and tangles may cause. If your pet becomes matted, do the humane thing, and allow your groomer to clip off the matted coat and start over again. Your groomer wants your pets grooming experience to be as pleasant as possible. We want your pet to like coming to see us, but if we are continually made to be the bad guy, by trying to de-mat your pets coat just so you won't have a shaved coat, it is not fair to your dog, or to the groomer. Most groomers are more than happy to show you how to brush out your dog. They will also show you the proper tools to do a good job. If your life style does not allow you the time to keep your pet brushed out, or your pet does not care to be brushed, talk to your groomer about a cut that will help get your pets coat in good shape. When a dogs coat is kept in good shape, your groomer can cut their hair to almost any length. If your dogs coat is matted and tangled, your groomer has no choice in the length of blade that he/she has to use to safely remove the mats from your pets coat. You can not ask your groomer to brush and pull mats out of your dogs coat and then wonder why your dog does not like going to the groomer. It is hard enough for a groomer to get your pet to enjoy the grooming process when we already have to get them wet, blow air on them to dry them, clip their nails, and pluck their ears. Don't ask us to brush their mats out too.